Were you involved at St. Mary Student Parish while attending the University of Michigan? We want to stay connected to you! Sign up to join our newsletter and read below for exciting alumni updates. 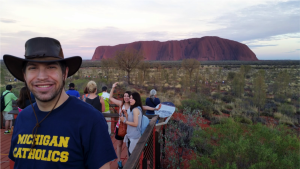 Andrew Brown ’11 shows off his Michigan Catholics t-shirt (left) at Uluru, Australia. Want to get your own Michigan Catholics t-shirt? Visit our online giving webpage and select the t-shirt from the fund drop down list. Be sure to note your size (S, M, L, XL) in the special instructions box. And don’t forget to email us a photo of you wearing your shirt in a notable place for a chance to be featured! Our first chapel was built in 1924, but our building as it stands today was completed in 1953. Since then, we have seen thousands of students come through our doors, seeking Catholic community during their years of study. Together, the alumni of St. Mary have created a valuable network of Catholic professionals living and working around the globe. Over the years our name has changed – St. Mary’s Chapel, Newman Club, Newman Catholic Student Association – and today our students call themselves the Catholic Campus Community. From dances, to mass, dinner, service and socials, St. Mary continues to serve the students, faculty and staff at the University of Michigan. We invite you to consider giving back to the campus ministry that impacted your college experience. No tuition dollars are used to fund campus ministry and we rely greatly on the gifts of people like you. Truly, no gift is too small.